The Diva | Cosa Mi Metto??? I'm really excited to show you this amazing first t-shirt from the shop Les Femmes, that depicts an icon of beauty and style. Lovely don't you think? To be updated with all the news from Les Femmes, like the launch of new beautiful t-shirts, I suggest you to like their facebook page, I've already done it!!! Two other eccentric news into my wardrobe are these snake printed heels from My Hot Shoes, and this personalized necklace with my initials, that you can find on Collana Con Nome!! Sono davvero entusiasta di mostrarvi questa fantastica maglietta del negozio Les Femmes, che raffigura un icona di stile e bellezza. Adorabile non credete? Per essere aggiornate con tutte le novità di Les Femmes, come il lancio di nuove bellissime t-shirt, vi suggerisco di mettere il mi piace alla loro pagina facebook, io l'ho già fatto!!! Altre due eccentriche novità nel mio guardaroba sono queste scarpe in stampa di pitone di My Hot Shoes, e questa collanina personalizzata con le mie iniziali, che potete trovare su Collana Con Nome!! Great outfit! You are totally gorgeous!! ..la t-shirt non mi fa impazzire, ma gonna e sandali sono stuependi! great skirt! The outfit is so glamorous! You look gorgeous! Great tee & skirt combination! I love Marylin :) Great snake shoes! deliziosa la t-shirt ... ma soprattutto ti dona moltissimo il rossetto rosso!!! Have a nice week-end dear!! Great party look :) I really like your lipstick clour- it fits great! Bellissima, il rossetto ti sta una meraviglia! Molto bella la maglietta, il colore delle tue unghie poi spiccano che è un piacere, complimenti ciao alla prossima, Angelo. I love your Marilyn shirt and dark lips! i love this outfit! looks really good on you! 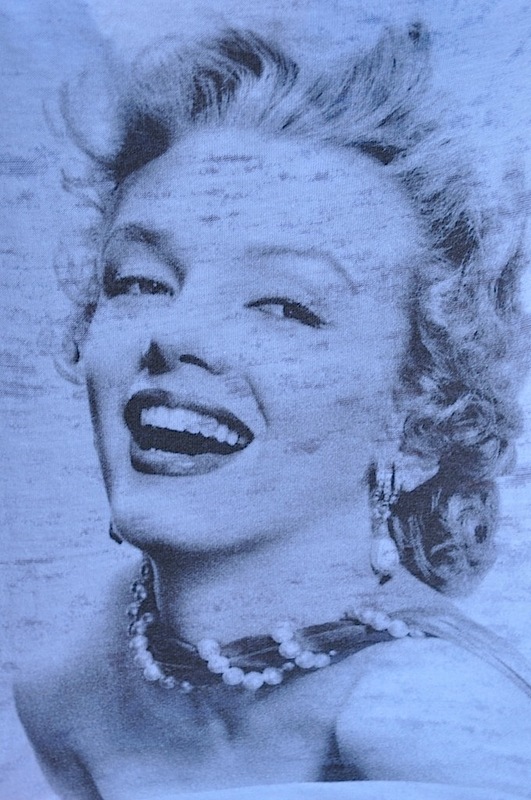 Eterna Marilyn!! E complimenti per essere stata selezionata da Glamour!!!! ps: ricordati del mio piccolo contest: mandando una fotografia di un vecchio viaggio dimenticato e raccontandomi in una riga cosa sa dirti quella foto oggi, avrai rispolverato un vecchio ricordo, sarai pubblicata sul mio blog e potresti diventare l'immagine di copertina della mia pagina fb per 15 giorni! un modo simpatico per fare un tuffo nel passato e promuovere il tuo blog! L'indirizzo a cui mandare la foto è costanza.saglio@gmail.com. C'è tempo fino al 12 agosto! Ti aspetto! adoro marylin :) è il mio mito! Ciao Fabrizzia ! Thank you so much for stopping by my blog and leave a lovely comment ! I am glade to discover your and I am already following you via GFC and Bloglovin ! Io adoro Marylin! !Di dive come non ce ne sono più! Ciao Fabrizia..tanti complimenti per il tuo bellissimo blog! mi farebbe piacere tu passassi dal mio! La vera Diva sei tu, no Marylin !!! dont like the shirt so much - but the combination of black glitter skirt and white tee is perfect! I love the shirt *__* And also the shoes! Beautiful outfit! and love your earrings. They look very luxury!!! Great outfit! I love this simple t-shirt and sequin skirt combo! I like those heels and skirt! ma che carina questa tee!! Preciosa camiseta y precioso outfit. Molto bella, mi piace e stai benissimo! The skirt is just breathtaking!!!! bellissimo outfit, ottima scelta per il rossetto rosso e soprattutto ADORO I TUOI CAPELLI!!! Awwwww love this shirt and skirt! I love this outfit, simple T-shirt and sequin skirt, great! Bellissima tee!!! Stai davvero bene con il rossetto rosso! Nice outfit! Love your skirt & those shoes are amazing! You look gorgeous. Great accessories. Lookbook, Facebook, Twitter, Chicisimo, Fashiolista, and Bloglovin. Great look !!! Love your shoes !!!! great great t-shirt and skirt honey, i love them!! Thanks for visiting my blog. I would to follow each other. I am now following you. Amo il tuo smalto! Bellissimo! Great t-shirt!! I love Marilyn! Love the sequin t-shirt combination! Did you know the anniversary of her death is August 5th? Tomorrow? Beautiful photos - thank you! wow, you look fabulous! your skirt is so lovely! Great shirt and I love how you combined it with the skirt!! Your blog is great, fun, and I can find nice things. Beautiful, girl! Love the outfit and your freckles. I love so much films with her! She always created very funny and lovely characters like in some like it hot!!! I will never forgot her! Lovely combination! T-shirt with Marlyn is the best! fabulous outfit, I love the t-shirt. you look amazing,love your t-shirt! Thank you so much for your amazing comments! Grazie mille per i vostri fantastici commenti! Tu molto bella Fabrizia e adoro la tee!! I'm here... Nice look, you're very pretty!! this t-shirt is great! in this outfit you achieved to show it and keeping the rest of the outfit simple! weel done! Hiii Fabrizia! Thanks for your comment! Lovely blog! Love your skirt! I'm following you now, follow me back? Loveee the make-up here, and the Tee of corse! Lovely Tee! How fitting that you wore on the 50th Anniversary of the amazing Marilyn Monroe's death.. This is such a great outfit to transition from day to night. I'm a huge fan!